Romitaman Original Comic Book Art :: Private Collection :: Spider-Man 1970s Spider-Man Published Watercolor Pinup! SOLD SOLD SOLD! by artist John Romita Sr. Check out this really neat 1970's leaping Spider-Man pinup, drawn entirely by the great John Romita Sr! 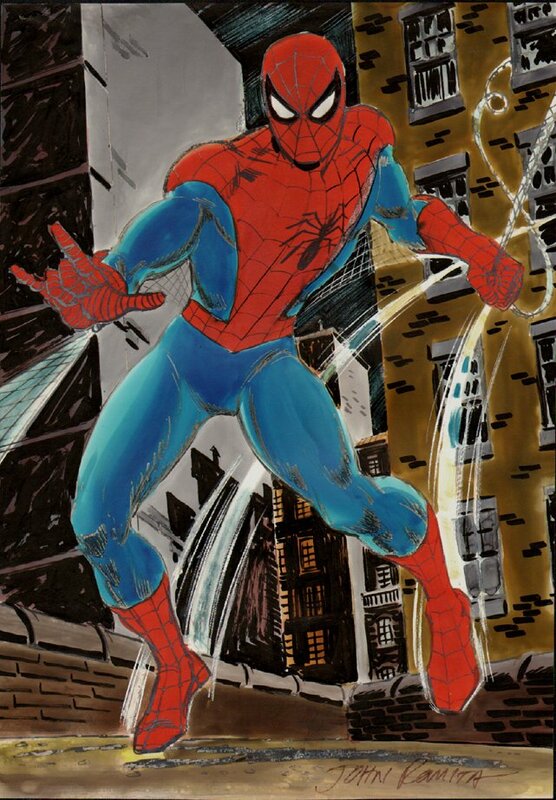 Firstly....This piece was originally a black and white stat, Then John Romita decided to color the entire piece with watercolor and other media for effect, and then He added ink lines to a majority of the Spiderman figure and all of the back ground areas so the colors would not overtake the line work. As far as I can tell... only the red chest area, and belt area on Spiderman and the mask area BELOW the eyes do NOT have any new black ink added...everything else on this piece is reworked ink and watercolor! This image was published on page 41 of the "ART OF JOHN ROMITA" Book, and this published image can be seen by clicking the red link above! 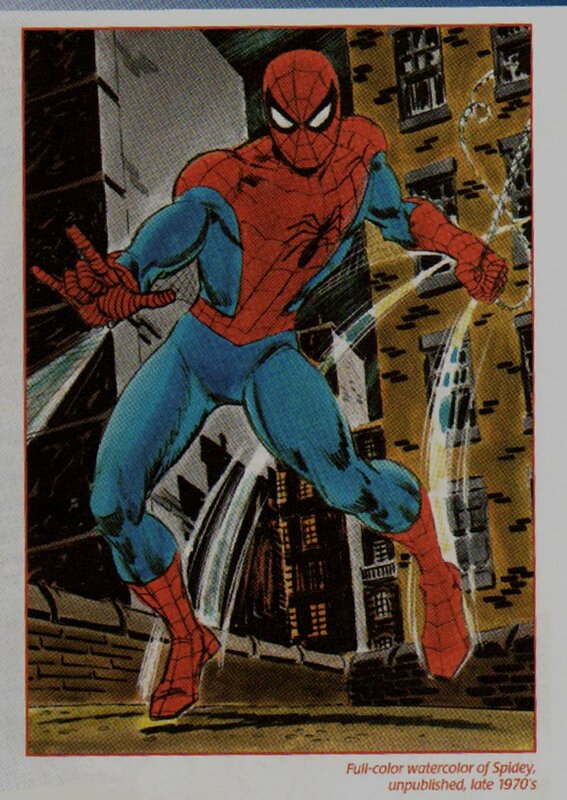 I can promise you that even though the Spiderman image was initially a stat...it took John Romita probably TWICE or THREE TIMES as long to create this piece than if he had simply drawn a pencil and ink Spiderman! RARELY if ever will you find COLORED John Romita Spiderman art for sale on the comic book art market! Actual art area measures 9.4 by 13.4 inches. This great piece is signed by John Romita at the bottom also and will look "AMAZING" framed on your wall! Don't miss out on this cool published pinup!